I go into a damp building, and then I leave three minutes later. My head already clogged, my emotions dampened, even though the exposure was slight. As I walk back to the car, I have a decision to make—do I let go or do I cling to the emotion of disappointment? Learning about the complexities of my illness is an every day endeavor. Nothing gives the invitation of self-awareness quite like chronic illness does. My emotions laid raw, because my life is indeed changing. I so want to hold onto this activist life of my past, but I can’t go into many of the building where the poor or the marginalized inhabit. Many churches, schools, and non-profits are housed in buildings that are often older and ones that I unfortunately cannot tolerate. What do I do? I’m thankful to say that I’ve found the contemplative path. One that brings me back to this every day decision of letting ego—of seeing my ego for what it is, and letting it go. I’m both needed and not needed, and that is freeing. My decisions are often simpler now. I’m friends with people who see my gifts and accept my limitations, ones who stick with me when a new symptom appears and I don’t know what to do. I’m friends with people who don’t lather on sunscreen around me, and who will meet in a building that’s suitable for me. I’m friends with people I practice yoga with, because we all are growing in self-awareness together—trying to bring a little more light to this world by going inward. I eat simply. I rest often. I read poetry and I teach kids who live with a lifelong limitation too, in the form of dyslexia. Mostly I interact with people one-on-one. I read the latest research on Hashimoto’s to take care of myself as best as I can, and try to include others in this process. I must let go of how I view my external world and how I hoped it would change when I healed enough to venture out of my home. But this vision is coming crashing down. I don’t truly decide if I can hang out in a group, what events I can attend, where an event is held, if I will need to leave once I show up. My body tells me, and I listen. I take a deep breath and learn to let go. 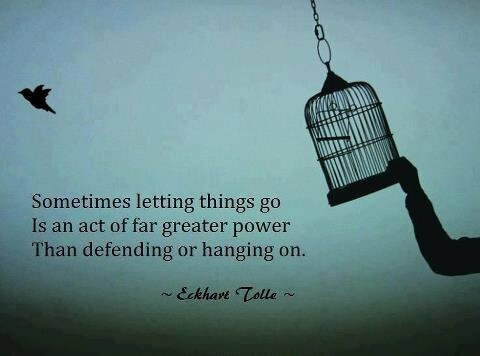 I’m learning to develop a healing vision that my act of letting go isn’t just about me and my healing. It somehow touches the world. I will never know how me leaving a building before an event even begins to protect my body blesses the world. But that’s not the point. It has taken years for me to experience that letting go doesn’t have to mean loneliness and isolation. For solitude is not separation. My solitude that I cultivate as I let go invites me to experience Oneness. I don’t have to be physically present at an event to experience connection. The Divine can be found as I let go—as I don’t resist the depths I was made to enter. And yet, there are many times I resist letting go, and I sense separation. I have created an illusion that I’m on the outside. Sure, that’s how it feels. No doubt about it. But the more I practice yoga, meditation, and centering prayer, the more I see that letting go in real life becomes a bit easier. I practice daily letting go on my yoga mat and in centering prayer—but the results come in my active life. My own life that quickly shows me my judgment, anger, and resentment. But there always exists an invitation to perceive differently. That I’m always connected to love. That there are bounds of creativity within me, even when brain fog makes it hard to believe that there is a creative bone in my body. I will enter plenty of damp buildings in my life. And I will leave, hopefully knowing that I’m not truly alone. Maybe even daring to believe that I can even give love from my absence as well as my presence.